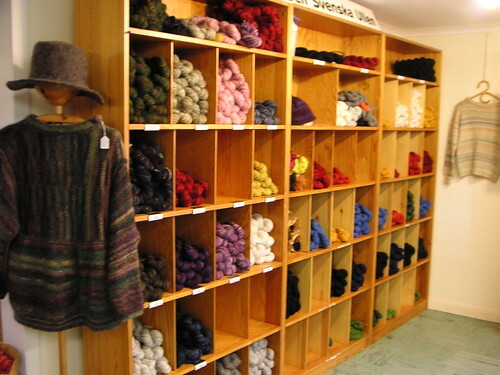 when we arrived in leksand on wednesday night, there were already lots of knitters at folkhögskolan. we were given our room, we dumped all our stuff and them went out on the town to find something to eat. we found a nice restaurant located on a boat at the quay. when we were having dinner, this lovely old steam boat went by. day one (thursday) started with an introduction by our wonderful organizers, sanna and karin, and after lunch it was time for part one of the first of our two courses. i had chosen two-end knitting (is that the correct term in english? ), mainly because i missed out on that when i took my knitting course at hv. karin kahnlund was our teacher, and she’s really great! for those of you who are unfamiliar with two-end knitting; it’s a knitting technique where you use two strands of yarn (using one ball of yarn). you hold both strands in your right hand and alternate between both strands, and at the same time twist them which yields a dense and durable result. 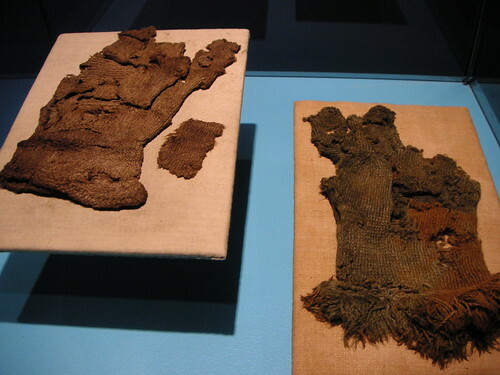 the technique is known in sweden since the 17th century and has mostly been used in mittens and socks due to it’s durability. you cast on differently than in ordinary knitting, and you hold the needles differently than in ordinary knitting, but once i got the hang of it, it was a lot of fun. it does take patience, it’s a rather slow technique, not just because of the way you knit, but also because you only use 2 mm or 2,5 mm needles (you can of course use a different size if you want to, but you won’t get the same result). and you only knit in the round. but it was great fun and i’m definitely hooked! there were no courses on friday, instead we went on an excursion to falun and dalarnas museum. i had never been there before, so this was a real treat. we were given a lecture on the history of two-end knitting in dalarna and afterwards we were free to roam the exhibitions. 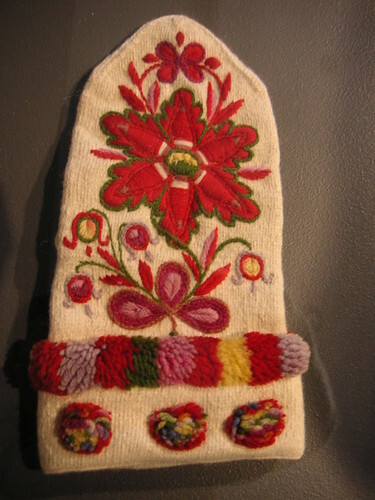 the exhibitions containing knitted artifacts and traditional folk costumes were the most popular… i very much enjoyed their art gallery where they showed graphic art by different artists, many of them local due to the fact that there were a graphic art workshop in falun until the 1970’s. this year’s stickstämma (i have yet to figure out a proper translation; knit-meeting?, knitting assembly?) 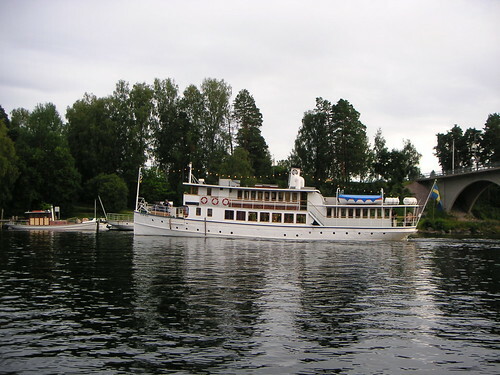 took place at leksands folkhögskola on the outskirts of leksand in the beautiful swedish province of dalarna. satoko and i left stockholm before noon on wednesday last week and after a few hours drive and a brief stop for lunch our first destination was sätergläntan. We browsed the shop, bought some yarn (pictures to come) and relaxed for a bit in their outdoor café with some homemade cookies. 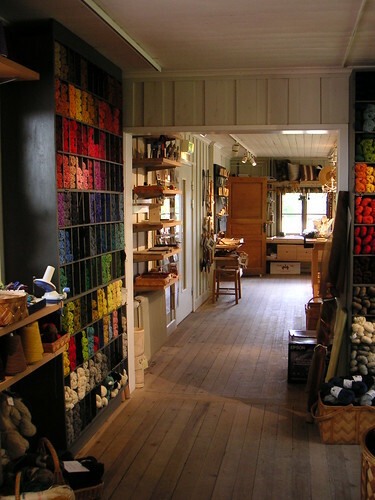 We peeked in at Insjöns linneväveri (weaving mill) but decided quickly that it wasn’t our cup of tea and continued instead to wålstedts woolen mill in dala-floda. we were almost late due to a slight misinterpretation of the somewhat incomplete map from eniro, but we gave them a ring from the car to make sure they were still open. we didn’t get a chance to see the actual mill, but we visited the shop and emerged several hundreds of crowns poorer than when we entered… not surprisingly! after our yarn adventures it was time to head off to leksand! summer vacation is over, but not summer itself. it’s quite warm here in stockholm but a bit cloudy today. a fair portion of my vacation has been dedicated to knitting and knitting-related things. my camera is filled almost to the brim and it will probably take me a while to get all photos sorted. but once i’ve done that, i have so many things to show you! the hourglass sweater is finished, the fisherman’s jumper is coming along, yarn has been purchased, new projects started, and knitting events have been attended. well, one knitting event. i will be back with photos and more information soon. oh, did you see the previews for the latest interweave knits, vogue knitting and rowan? looks like we have an interesting autumn ahead of us!